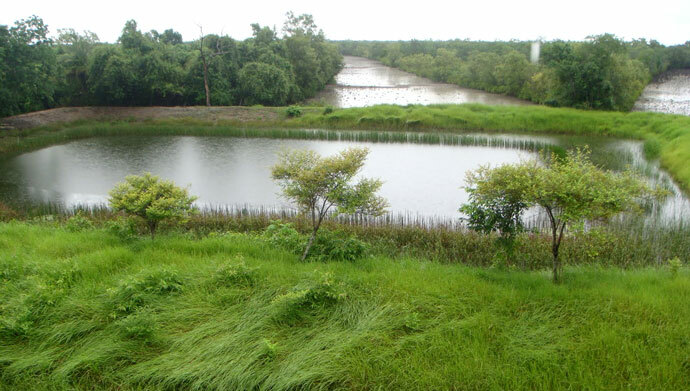 Sajnekhali Wildlife Sanctuary at the confluence of Matla and Gumdi rivers, covers an area of 362.80 sq.km. It was notified in 1976 vide notification no.5396-For, dt.24.06.1976. is considered a part of the Sunderbans ecosystem. It lies on the confluence of Matla and Gumdi rivers within the buffer zone and spreads across an area of 885 sq km. Nearest airport is Kolkata Airport, 112 kms away. Canning Port, 44 kms away is the closest railhead. Reach Basanti or Sonakhali from here and take a boat to Sajnekhali. The Park is approachable by road from the nearest town of Kolkata, wherein you reach upto Namkhana, Raidighi, Sonakhali and Najat by road and proceed by motorboats through the sanctuary. With a rich and varied avian population, the Sajnekhali Sanctuary provides a visual treat for your eyes. The most noteworthy among the feathered flock are spotted billed pelican, cotton teal, herring gull, Caspian tern, grey heron, large egret, night heron, open-billed stork, white ibis, common kingfisher, brahminy kite and paradise flycatcher. The area is also important for waders, including the Asian dowitcher, a rare winter migrant. The trained eye will be able to spot several birds of prey like the osprey, Pallass fish eagle white-bellied sea eagle, grey-headed fishing eagle, peregrine falcon, Oriental hobby, northern eagle owl and brown fish owl. Spectacular sight of colorful Kingfisher, Plovers, White Bellied Sea Eagle, Sandpipers, Whimbrels, Lapwings and Curfews can be seen here.